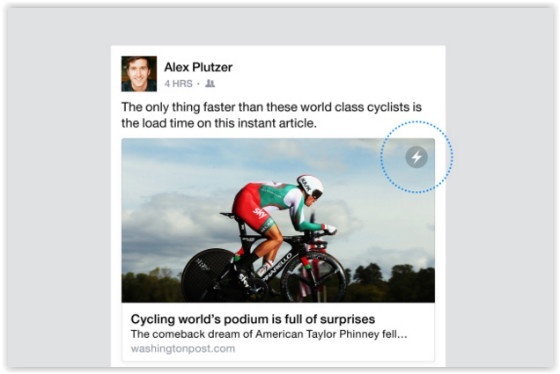 Facebook announced earlier this week that, following a successful beta testing, its Instant Articles service will now show for Facebook users on iPhone. Instant Articles for Android will launch later this year, with its beta test starting this week. Although it has been five whole months since Facebook introduced its Instant Articles feature, it has finally begun to pick up speed, with thousands of Instant Articles being published on a daily basis for iPhone users. In an announcement made on 20 0ctober, Facebook confirmed that 14 outlets had signed up to publish Instant Articles, with names such as Billboard, Bleacher Report, E! News, Mashable and The Weather Channel further said to be joining their current BuzzFeed, National Geographic and MTV News counterparts. The articles are said to load 10 times faster than standard links on mobile devices, as well as garnering more shares. With daily readers almost reaching the one billion mark on Facebook, it’s clear that the feature already has an advantage over its competitors – namely the Apple News app and Google’s Accelerated Mobile Pages. A small lightning bolt found in the top right hand corner will signify a post as an Instant Article. Once loaded, all ads within the instant articles will generate revenue solely for the publisher, making them even more appealing for current prospects. Based on current performance statistics and the speed in which publishers are currently joining up to the service, Instant Articles have the potential to soon be populating much more of your News Feed than they have in previous months.